Woodbury, CT – On Wednesday, April 11th Schwenke Auctioneers will hold its April Fine Estates Auction with an offering of over 440 lots of freshly consigned estate property. 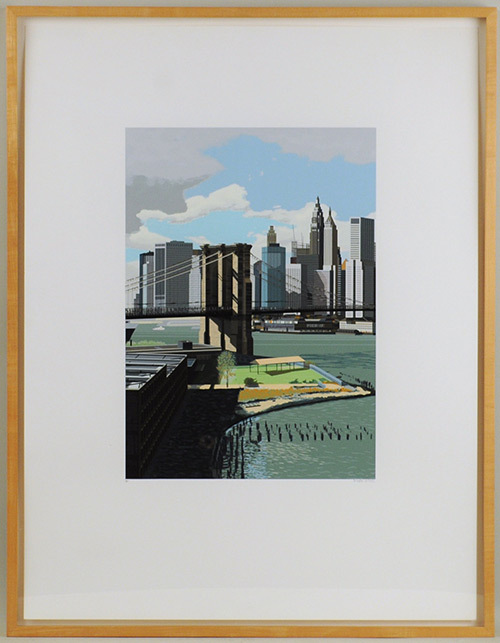 The auction features property from estates in Fairfield County, Connecticut; New York City and Buffalo, New York; Morristown, New Jersey; and property from the collection of a Westchester County lady. 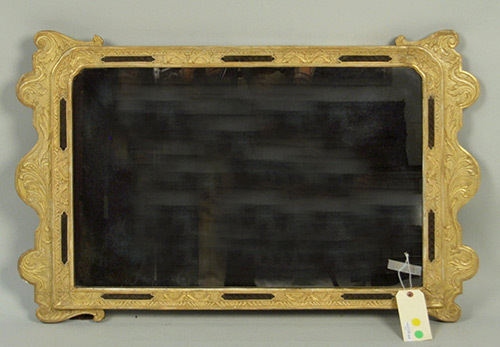 Property being offered includes a broad selection of Asian decorative arts, American, English and Continental decorative arts, folk art and American country furniture, early English & other sterling silver, jewelry, fine art, miscellaneous decorative arts, and estate oriental rugs. This auction is a live online sale with absentee and phone bidding, plus live internet bidding on multiple platforms. The auction begins at 5:00 pm on April 11th. Preview times are Sunday, April 8th from noon to 6:00 pm; Monday, April 9th and Tuesday, April 10th from 10:00 am to 5:00 pm, and Wednesday, April 11th from 10:00 am to 4:00 pm. Preview is also available at other times by appointment. 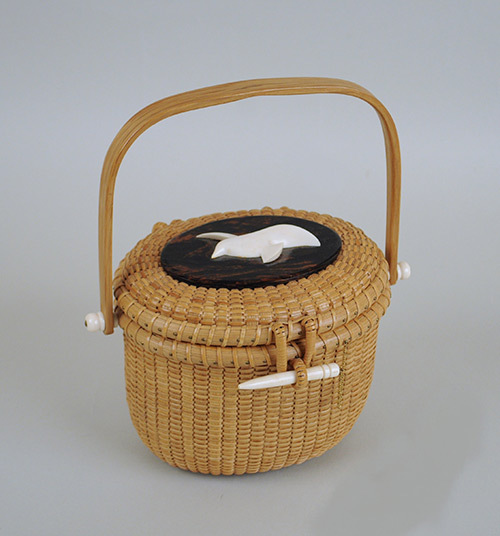 The gallery is closed from 4:00 pm on auction day. 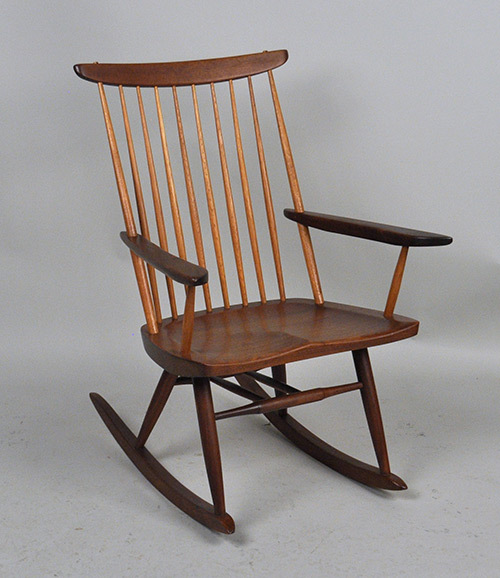 Prime among the estate lots being sold is a George Nakashima Studios rocking arm chair, purchased by the consignor’s parents from the Nakashima shop in New Hope, Pennsylvania during the 1960’s. The chair, which bears a script “studio” written on the bottom of the seat, is in remarkably fine condition, with only minor expected age and use wear, measuring 35 ¼” high, 24 ¾” wide, 16 ½” deep. The chair carries a pre-sale estimate of $2,000-3,000. 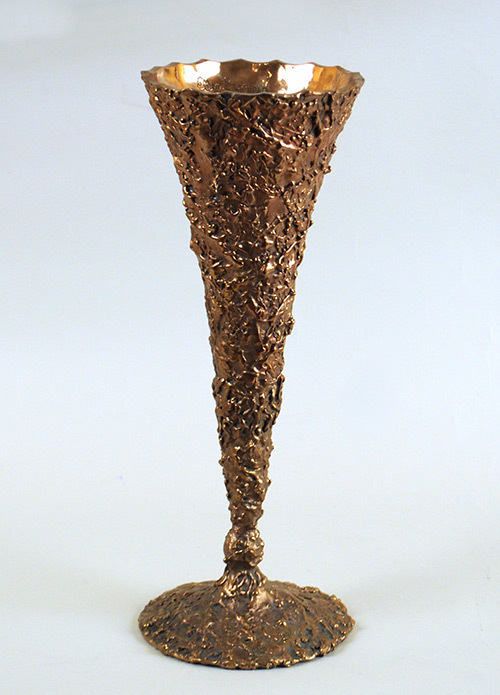 Modern lots include several paintings by Tom Buchanan, and a brutalist bronze vase by Ellen Brenner Sorensen, of elongated tulip form, signed inside rim “Ellen Brenner”, and measuring 17” high, 6 ½” diameter. 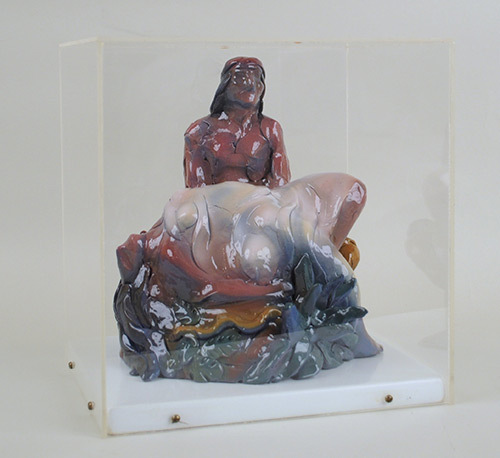 Another contemporary lot which is expected to draw bidder interest is a L. Jimenez (Mexican/American, 1940-2006), fiberglass/resin sculpture entitled “Southwest Pieta” and dated 1983, signed “Luis Jimenez” and dated on base, presented in a plexiglass case together with two autographed artist’s catalogs, with the sculpture measuring 9” high, 8” wide, 7” deep. 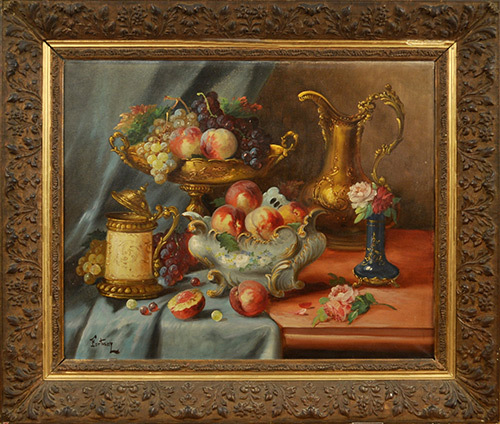 The provenance is purchased from Lew Allen Gallery, Santa Fe, NM; Property of a Westchester County, NY Estate. The pre-sale estimate is $4,000-6,000. Several fine Asian lots are being offered, including a Meiji period Japanese Koto musical instrument with intricate inlays, silver and gilt lacquer and applied metal decoration; an early Kano school Japanese six panel screen, framed, ink and colored ink on paper, depicting a landscape scene with temple of Ichiyam-dera near Kyoto, possibly late Momoyama or Early Tokugawa Period (16-17th century); two Chinese carved tusks of ladies amid peonies, each measuring over 13” high; a pair of Japanese blue and white baluster vases with applied cicada decoration; a rare Japanese “step” tansu; another tall Japanese tansu; a pair of mid-century Japanese brass openwork pierced hanging lanterns; a near pair of Chinese wucai sleeve vases, one with figural decoration and one with bird and flower decoration, each 9 5/8” high, 6 1/2" diameter. Other Chinese lots of interest are a group of Chinese blue and white porcelain wares in the Fitzhugh pattern; several groups of Chinese canton blue and white wares; a group of four Chinese framed porcelain plaques, 21 1/4" high, 18 1/2" wide; and a Chinese export armorial plate with unidentified family coat of arms, from the estate of Ursule and Charles Cahn. Rare early Persian ceramics and pottery are being offered, including a Persian/Iranian pottery Rhyton cup, of gazelle form, with raised eyes, stylized horns and front legs, body extending into a conical shaped vessel, 9 1/4" high, 9" deep, and several other Persian pottery dishes and bowls, also from the estate of Ursule and Charles Cahn. Sterling silver on offer includes various examples of English 18th and 19th century sterling, with a prime lot being a five piece sterling Watson & Briggs tea/coffee service in the "Circa 1790" pattern inscribed, dated on base '47, comprising a hot water kettle on stand, teapot, coffee pot, covered sugar, creamer, and waste bowl, with gross weight of 136.105 OZT, with provenance as Property of a New York lady. The set has a pre-sale estimate of $1,500-2,000. 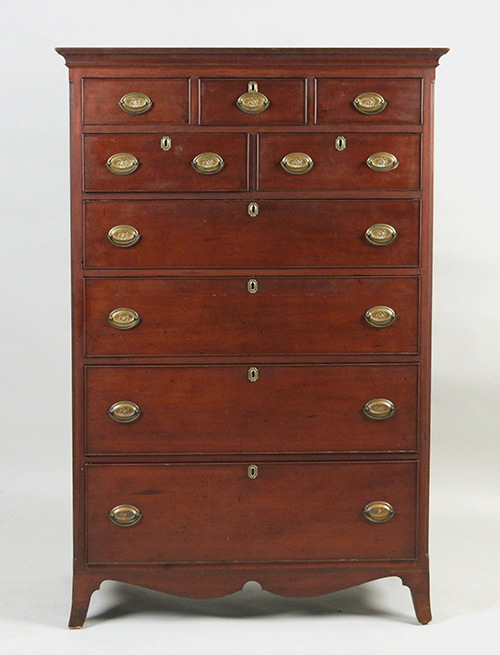 Many lots of early English Queen Anne and Georgian furniture are being sold, as well as furniture of Continental origin. 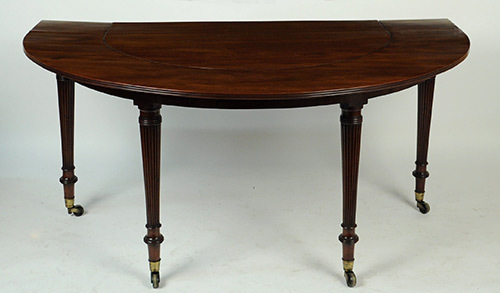 The top lots include a fine George III wine table; a George III inlaid mahogany butler secretary; a diminutive George III bachelor chest with dressing slide; a rare French marble top dessert server; a George III carved mahogany slab table; two George III mahogany pillar base dining tables; several period stands and tables; a rare Carrubo wood Italian Inlaid pedestal desk with a central panel depicting an aristocrat being offered gifts, profusely inlaid overall with flowers and gargoyles reminiscent of Renaissance decoration, and the facade of serpentine form, dating to the mid-18th century and measuring 48" wide, 29" deep, 32" high. The striking desk has a pre-sale estimate of $1,200-1,800. Other important English furniture lots include a rare pair of Georgian mirrored hanging corner shelves, with shaped rosewood veneered frames and three serpentine shelves, measuring 36" high, 19" wide, 9 3/4" deep, with provenance property of a New York lady; a George III brass bound cellarette; a rare pair of English queen anne footstools; and a pair of unusual tall English carved mahogany hall chairs. 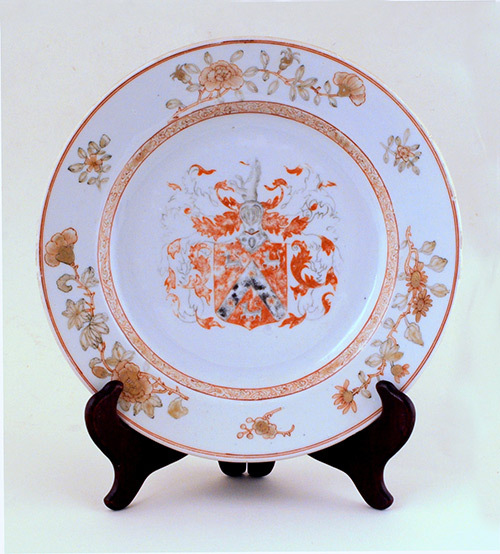 English and Continental porcelains from various estates are on offer, including several Meissen, Dresden and Capodimonte porcelain figural groups and a large group of “The Blind Earl” reissue in "1770" pattern comprising thirteen demitasse cups - six with straight rim, seven with scalloped rim, fourteen saucers, nine cups and saucers, nine bowls, three oval serving bowls, pair handled serving bowls, five various small serving dishes, two large bowls, square tray, coffeepot, covered sugar, two creamers. Provenance of the group is property of a New York lady. 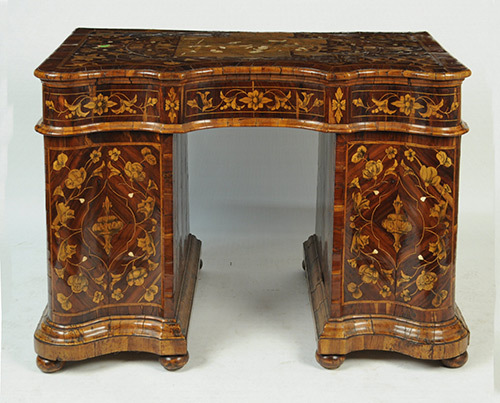 American furniture in the sale includes a New York federal inlaid mahogany serpentine chest, a New England maple queen anne corner chair, several inlaid and other Pembroke tables, a Philadelphia Sheraton chest, and a classical Philadelphia marble top pier table, school of Anthony Quervelle. 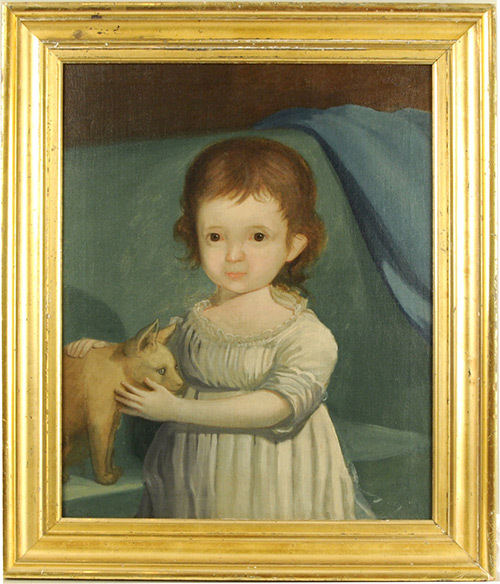 American folk art items include a whimsical carved and painted alligator Mardi Gras head piece, a primitive folk art portrait of a girl with cat, and several other folk art portraits and landscape paintings, including a fine folk art watercolor nautical painting depicting “The Westwood” at full sail, J. Ledger, Commander. 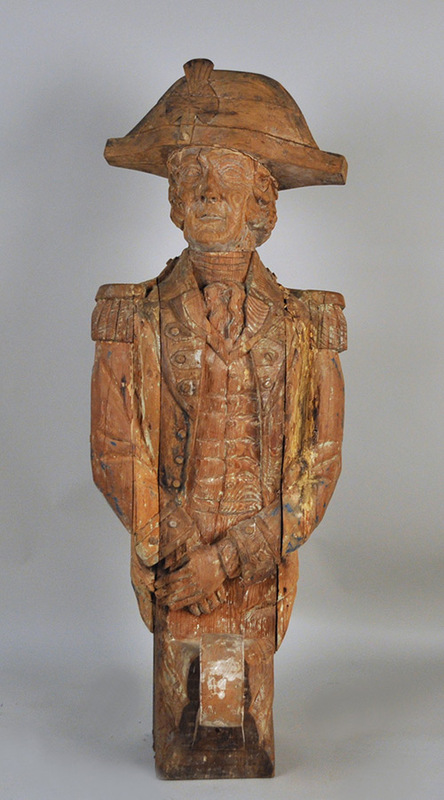 Of special interest is a carved wood ship’s figurehead of Lord Nelson, the half-length figure in Naval uniform with traces of original polychrome, the carving measuring 66" high, 22" wide, 10" deep. 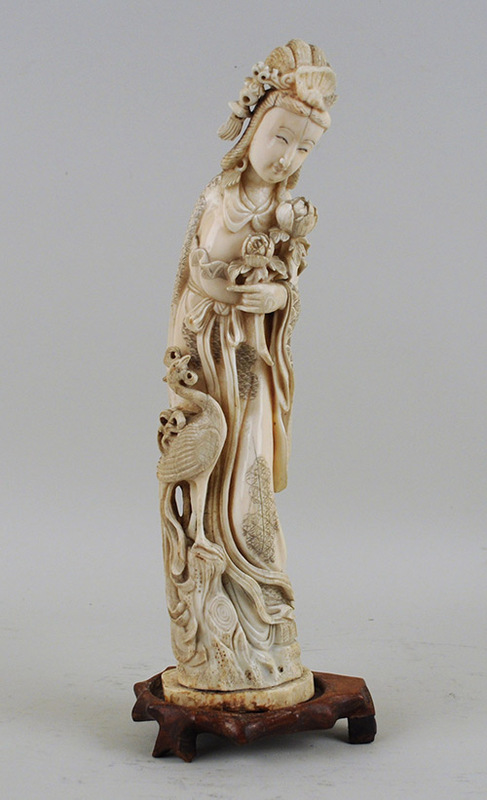 Other folk art, academic and contemporary fine art lots are also being offered. Of special interest are a small oil on canvas landscape scene attributed to Thomas Chambers, a wooded oil on canvas California landscape scene signed “William Wendt”, a very fine framed portrait of a lady attributed to Thomas Sully, and a framed watercolor by Diego Rivera (Mexican, 1886-1957). Also expected to generate interest is an oil on canvas depicting a court scene by Ernest Jean Delahaye (French, 1855-1921); a work by Edward Antoon Portielje (Belgian, 1861-1949), "Tea Break With Baby" O/C; Florent Willems (Belgian, 1823-1905), oil on canvas “Couple by Piano”; and a J. Duveau impressionist summer beach scene, oil on canvas, signed lower right with paper label verso, 20th century, measuring 25 1/2" high, 29 1/2" wide. 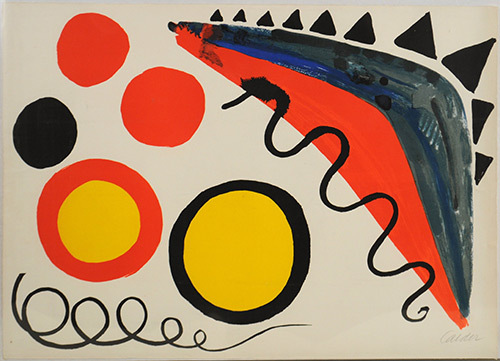 Of special note is a pencil signed lithograph by Alexander Calder (American, 1898-1976), titled "Cinq Boules Et Deux Serpents", from the edition of 90. The work was drawn and printed at the Studio of Arte Adrien Maeght, an edition issued by Galerie Maeght 1965. Printed to the full sheet size as issued, measuring 21" high, 29 5/8" wide. The work was registered with the Calder Foundation under Application #A14605-UN3. Over two dozen estate oriental carpets will cross the block, including Persian, Caucasian, Indian and Turkish room and scatter sized rugs. 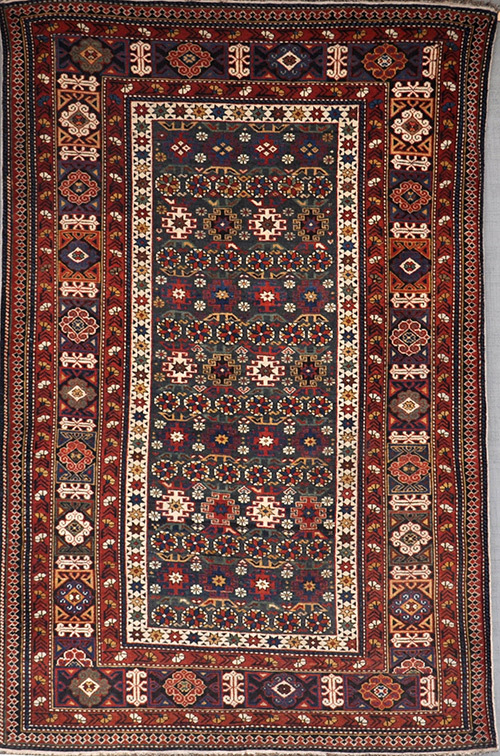 Of special interest is a fine Caucasian Shirvan rug with unusual green ground, 3’ 7” by 5’ 5”, consigned by a local estate, with a pre-sale estimate of $600-900.